Above is an electrophoresis of a patient suspected to have sickle cell disease. A blood sample was taken from him and the erythrocytes were separated. After lysis of the RBCs, hemoglobin was released and it was run on a polyacryamide gel. Electrophoresis was carried out and Western blot was performed to located the hemoglobin. 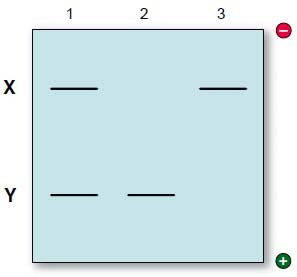 The principle of electrophoresis is that the the more negatively charged particles move towards the positive pole and vice versa. In the case of sickle cell disease, glutamate is substituted by valine at the 6th position of the beta chain. This removes a negative charge from the chain and thus in the electric field the mutated chain will not move as far towards the positive pole as does the non-mutated chain. 1) X is a band that represents the mutated HbS. 2) Y is the normal Hb. 3) 1 is a carrier of HbS i.e. having one normal and one mutated chain. 4) 2 is a person who does not carry any mutant alleles. 5) 3 is a person having the disease i.e. two mutant alleles.